Advanced Fluid Systems’ filter products and custom filtration systems can help you extend component life, reduce system down time, and reduce other maintenance costs. Proper filtration and fluid monitoring can not only save you money, but help you schedule regular maintenance and identify the source of contamination. Advanced filtration systems allow you to clean and condition your system’s fluid regardless of the system’s operation or location. Examples of some systems include mobile filter carts, fluid transfer carts and high flow filter skids. Filter 100% of “Free” water. (See the fluid vacuum dehydrator section below regarding dissolved water removal). Optional integrated particle counters and water sensors report fluid quality in real-time. Mobile filter carts can easily be moved from system to system for regular conditioning. Custom layouts and enclosures for improve accessibility and maintenance. Fluid vacuum dehydrators provide total fluid conditioning by removing particulate; 100% of free water and gases; and dissolved water to 20 PPM (.002%). Dehydrators can greatly reduce operating and replacement costs while extending fluid life and can be moved from one system to another, or installed permanently for continuous conditioning. 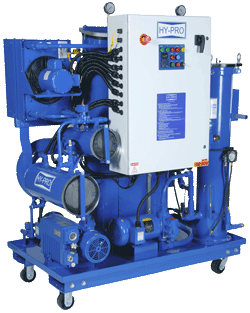 Learn more about our hydraulic filtration rentals. “SVR” Varnish Removal system – Removes free and dissolved oil varnish, particulate contamination and reduces acidity (TAN) to normal levels without removing critical oil additives. “CO” Coalesce Skids – Remove free water and dissolved water to 150 PPM in turbine lube oil and 75 PPM in diesel fuel, while removing particulate. “FSL” Filtration Skids – Dedicated filtration for gearbox, kidney-loop, fluid transfer and high viscosity applications. 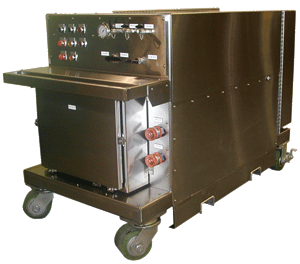 “FCL” Filtration Cart – Mobile version of the FSL filtration skid, the FCL cart features wheels and a retractable power cord. “FC” Filter Cart – Portable filtration system on a two wheeled hand-cart. Ideal for transferring new fluid and conditioning oil before use. “FPL” Spin-on Filter Panel – Mounted filtration panel ideal for filtering replenishment (top-off) fluid or as a kidney-loop adder existing applications. Learn more about Hy-Pro’s full line of Fluid Conditioning Equipment here. 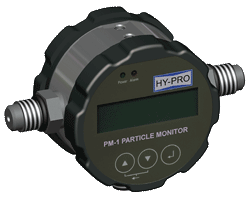 The Hy-Pro PM-1 is a compact, easy-to-read particle counter for on-line and off-line use. Advanced Fluid Systems can help you find a particle counter that accurately measures fluid cleanliness and dissolved water in your hydraulic fluid. Particle counters are available as portable test units or can be installed permanently for continuous monitoring. Particle Counters are available with LCD, thermal paper and computer terminal interfaces for quick, easy output. Be sure to check out our Fluid Analysis services for in-house and 3rd party fluid testing.